Buddha's Eyes Tattoo Meanings - On almost all Buddhist shrines (stupas) - especially in Nepal - a giant pair of eyes look out from all four sides of the main tower, seeing in all directions. 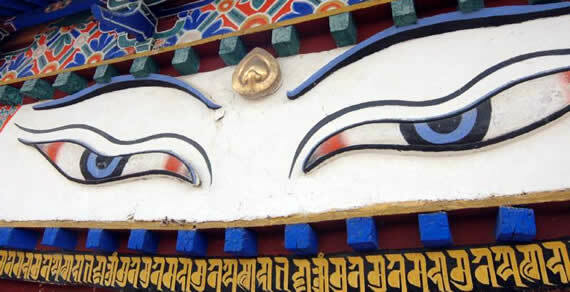 These are Buddha Eyes, or Wisdom Eyes, and they symbolize Buddha's omniscience. They are meant to remind us to cultivate compassion towards all living creatures, and to be mindful in everything we do. For the Nepalese, the Buddha's Eyes have come to symbolize their nation. The graphic does not include a nose, but instead there is a curl with a descending tail, much like a question mark, which is actually the Nepali character for the number '1'. This stands for 'non-duality', the true nature of reality, and also a reminder that the one sure way to attain 'moksha' (freedom) is through the Buddha's teachings. 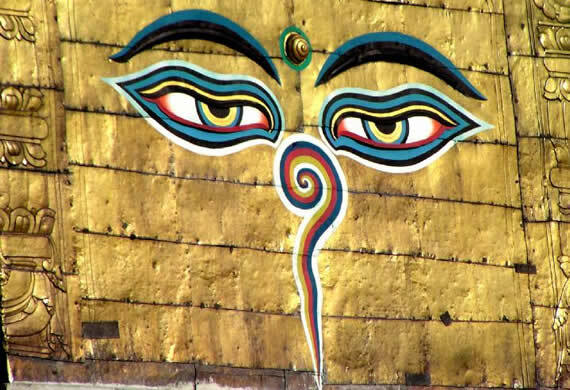 Above and between the Buddha Eyes is a smaller 'third eye', suggesting the all-seeing wisdom of the Buddha. A Buddha Eyes tattoo is a responsibility not be taken lightly. It's going to attract attention because it's not only highly graphic but because it is, after all, a stare. People don't like to be scrutinized. But therein lies the essence of the Buddha's stare - it's a look of detachment. It's not the glare of criticism or appreciation, nor does it even look like the kind of love we're familiar with. But neither is it indifference or lack of love. Better make sure your artwork displays the right attitude before you begin. Buddha Eyes display real love. Real love has nothing to do with appearances or other transient displays projected by the human ego. Buddha Eyes don't reveal the slightest hint of personal ambition or acquisitiveness. The eyes simply witness. They don't react to what is seen. They allow. Tune into the eyes, and you experience a vast space free of all judgment. That's because Buddha Eyes see the Buddha nature in everyone. With great compassion, the eyes are watching and waiting for everyone to awaken to their true nature. It's important that the eyes display this detachment, because the essence of spirituality lies in the perception of reality after the ego has been dethroned. Ego-attachment leads to eyes filled with infatuation and desire. Even the love we have for our family is an 'attached' kind of love. Buddha consciousness is synonymous with a love that's not bounded by relations of any kind. This is love and compassion, and it's only possible after one knows the difference between appearances and reality. The power and compassion we see in Buddha Eyes are the product of a spiritual shift - of replacing the personal with the universal. With the bigger perspective, we see the truth behind appearances, and we instinctively know how to behave, which includes an imperative to help and teach others.